For most of us, the summer months bring parties, vacations, trips to the beach, and more leisure time outdoors. To cope with the warmer weather, we like to wear shorts, sundresses, and sandals. Yet, some people dread the summertime because it means inflammation, redness, and painfully swollen ankles (sometimes referred to as “edema”). Around this time of year, the NYC foot doctors at the Center for Podiatric Care and Sports Medicine see many patients looking for solutions to reduce swelling. Here are a few of our secrets! Do your ankles swell up in the summer? Find out why and what you can do about them. 1. Too Much Salt – When your body has too much sodium and not enough water, your body retains any water you do drink, thereby causing swelling. 2. Heat – Excess body heat can cause the blood vessels to expand, allowing fluids into the surrounding tissues. 3. Gravity – Too much standing or sitting can cause the fluids in your body to pool in the lower extremities. 4. Organ Failure – Problems with the heart, kidneys, or liver cause circulation issues, resulting in ankle swelling. 5. Medications – Antidepressants (MAO inhibitors & tricyclics), calcium channel blocker blood pressure pills, estrogen-containing hormone birth control pills, testosterone, and steroids can all cause ankle swelling as a side effect. The overweight and the elderly are also at increased risk for ankle swelling. If your socks or sandals are leaving marks on your skin, then chances are you have edema. As you probably already know, raising your legs above heart level is the first step for treating swollen ankles. 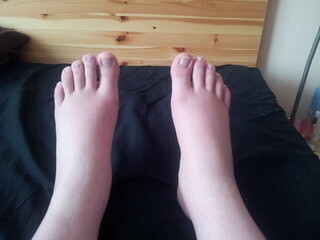 Elevating the feet for an hour should be enough to reduce benign episodes of summer swelling. Even elevating your feet on a stool will help. If you can’t kick back and relax, try wearing support stockings or compression socks, moving around, or massaging your ankles to increase circulation. – Drink more water! You should be drinking at least eight glasses a day. – Limit dietary sodium. Pass on table salt, salted peanuts, pretzels, chips, breakfast cereals, and these surprisingly salty foods. – Avoid really long walks in the heat. Choose to exercise during the cooler parts of the day. – Massage the feet and ankles to promote lymphatic drainage. Use a cooling cream for added relief. – Try a cooling ankle brace, ankle coldpack, polygel pack, or ankle wrap. – Flex and bend your ankles in circular motions to get your blood moving. – Cool your ankles down by placing a wet towel over them. – If you work a desk job, try a folding exercise peddler to keep your legs moving. – If you stand all day at work, take “walking breaks” during the day to ease discomfort. Medical professionals will help you identify the root cause of your ankle swelling, particularly if it’s a chronic condition. We’ll want to rule out issues, such as blood clots, heart failure, and Achilles tendinitis. In severe cases, you may need to be admitted to an emergency room and hooked to an IV to receive fluids. There are also medications that can reduce swelling and inflammation. At a sports medicine clinic, we can assess your biomechanics to see if the way you’ve been standing or walking is contributing to the problem. Book an appointment with our NYC sports medicine doctors online.